In the wake of an NBC4 I-Team investigation exposing dangers tour buses pose to highway safety, two drivers have been suspended. Safety experts who viewed the I-Team’s investigation said the behavior NBC4 documented by tour bus drivers puts all drivers on the highway at risk. During a three-month investigation, the drivers were caught on camera by the I-Team using handheld cellphones while speeding down freeways, which is against federal regulations and state law. Both men worked for a company called Fronteras del Norte, which operates 13 buses that drive over a million miles a year to cities up and down the West Coast. One driver, who appeared to be texting while driving down the 5 Freeway from Los Angeles to San Diego, was suspended by Fronteras for 15 days without pay and put on one year probation. "He knows that’s against the law," said Fronteras owner Joel Lopez. 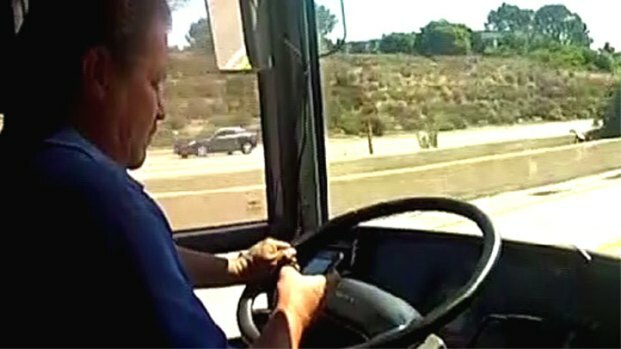 Drivers of tour bus companies that carry loads of passengers along the West Coast were caught on camera violating federal laws as they texted, talked on handheld cellphones, drove at speeds higher than 80 mph and blew through red lights. None of the bus companies caught during the investigation were willing to talk about the violations. Joel Grover reports for the NBC4 News at 11 p.m. on Monday, Nov. 4, 2013. The driver told Fronteras he was searching for music on his phone, but using a handheld device for that would also be against the law while driving a bus. Fronteras also suspended a second driver caught on video by the I-Team. That driver was talking on his handheld phone most of the trip from San Diego to LA, and at one point was so distracted he ran a red light. Because of the illegal behavior the I-Team uncovered, Fronteras says it will soon put plainclothes supervisors randomly on its buses to watch driver behavior. The company also said it plans to print signs to put on all buses asking passengers to report any inappropriate driver behavior to the company. "Hopefully (the customers) will take the time and call us and let us know that the driver is doing something that’s not supposed to be done," Lopez said. The I-Team is also continuing to try and speak with U.S. Secretary of Transportation Anthony Foxx about illegal behavior it documented by drivers of six southern California tour bus companies. So far, there have been eight major tour bus accidents on California highways this year during which people have been injured or killed. The I-Team has been requesting an interview with the Transportation Secretary since a fatal crash in February, but his office has repeatedly declined.